Thanks to you all I am going to try and finish finish the Halloween stuff before posting, but if that can't be done I will still show the unfinished stuff. 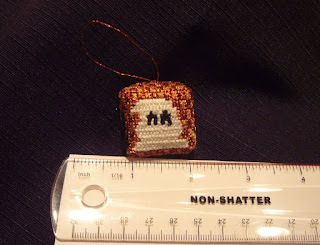 So first I give you the Halloween Motifs which was part of a monthly series called Seasonal Blocks (little cubes about 1 inch square) put on in 2003 by Fireside Stitchery which is a shop in Frazer, PA and does mail order too. 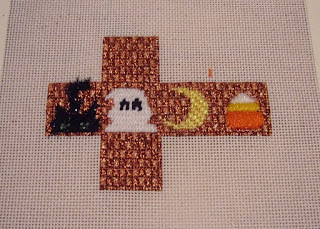 I stitched the Easter cube and the Halloween cube (woo hoo 10 to go)! I told myself I would absolutely NEVER join another monthly club again!!! So a few years later I joined the monthly cookie cutter club! All kits safely stored in my stash closet! Dare I tell you that in 2007 I also joined a slightly different monthly club - a kit came every two months and it will make a Halloween cat. Maybe one day I can show you all!! Can you guess, Fireside Stitchery is such an enabler! Back to the present. This is a Kathy Schenkel Designs Painted canvas with stitch guide, and kit. I will give you a picture of it flat so you can see all the motifs and then a picture of it made into the cube - which I did last night. I could have also purchased the optional bead kits to make a beaded tassel and hanger, but I opted not to do that. If I had done that, they would be in the areas without the motifs. Very nicely done, and I bet it was a fun stitch. That is just adorable. Great finish. What a sweet little cube!